Geoffrey Martin – known to virtually everyone as ‘Paddy’ – is one of the truly great characters of Tasmanian football. During an involvement with the game spanning nearly seven decades Martin has helped shape the careers of countless footballers across the state, nowhere more so than on the north-west coast, where his impact on the game is legendary. Martin was born in Launceston in July 1927 to a family with a strong sporting pedigree, albeit in a different arena to the one in which ‘Paddy’ would make his mark. His father Geoffrey Snr was an excellent batsman who had played 23 first class cricket matches for Tasmania from 1921-33, while his uncle Gordon had played four first class cricket matches for Queensland. Paddy himself appeared for Tasmania against Victoria at the NTCA ground in Launceston in 1950-51, scoring four and a duck in his only first class match. Martin’s football journey started in 1945 with Launceston in the NTFA when he was just 18 years of age. He made an immediate impact on the football landscape and was selected in an NTFA representative side the following year. In 1947 he headed south to play with TANFL side Sandy Bay but only stayed for one season, returning to Launceston in 1948. 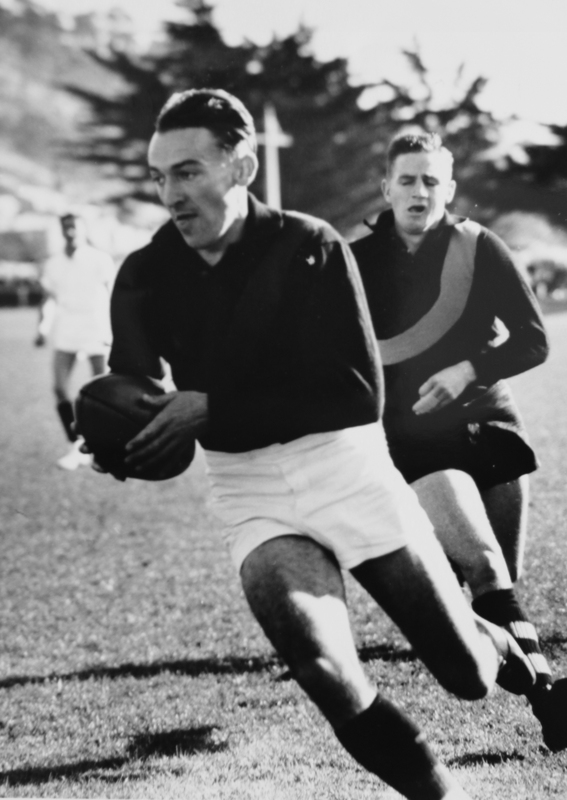 He played in his maiden senior premiership in 1951 under coach Noel Atkins before taking on the role of captain-coach in 1952 at the age of just 25, with Atkins resuming the coaching role at the end of 1953. During Martin’s second stint at Windsor Park he was afforded state representative honours twice, including his selection in the team for the 1953 National Carnival in Adelaide. He also attracted an overture from VFL side Melbourne, whose offer he ultimately declined in favour of staying in Tasmania. After 116 games with the Blues, Martin relocated to the north-west coast following the 1954 season and joined the Ulverstone Football Club. It was to be the start of a golden run of personal success for Martin, who achieved six senior premierships in the next six seasons: three in a row with the Robins from 1955-57 under Arthur Hodgson – including a state premiership and Best and Fairest for Martin in 1955 – followed by another hat-trick of flags from 1958-60 as captain-coach of Burnie. During this period he also gained NWFU representative honours, captaining the NWFU side in 1959. Martin retired as a player following the 1960 season after more than 300 senior games. He was immediately appointed as non-playing coach of the NWFU representative team, arguably his greatest footballing role and one he held for the next six years. His coaching tenure came at a time when the North-West Football Union was at the peak of its power. Martin guided the union to six consecutive representative victories, his coaching genius playing no small part in the league’s intrastate success, though he is hesitant to take much of the credit. He maintains that he is “eternally indebted” to the late Roy Cazaly and Norm Smith – champion coaches both – whose guidance and friendship during his early years as a coach were invaluable. Martin also credits his great success to the many champion players he had under his leadership, including Len Hayes, Terry Shadbolt and the iconic Darrel Baldock. As Martin puts it, “you can’t win a race unless you’ve got a good horse”. Martin did coach again at club level, firstly with Burnie for part of 1965 and then with Devonport for two seasons in 1970 and 1971. He remained a household name following his playing and coaching years due to his presence in the media, including commentating for the ABC alongside Tim Lane and Neville Oliver. He has cemented his status as one of the icons of the game on the north-west coast, acting as a patron for the NTFL/NWFL for more than 30 years.